Our extensive review of the 4 best Tower inflatable paddle boards to help you decide, which is best for you. Nose rocker 4" 4" 4" 4"
Length x Width 9'10" x 32" 10'4" x 32" 12'6" x 30" 14' x 32"
Height 6" 6" 6" 8"
Extras Detachable SUP center fin, Tower branded deck pad, and repair kit (with patches and valve wrench; glue not included). Detachable SUP center fin, Tower branded deck pad, and repair kit (with patches and valve wrench; glue not included). Detachable SUP center fin, Tower branded deck pad, and repair kit (with patches and valve wrench; glue not included). Detachable SUP center fin, Tower branded deck pad, and repair kit (with patches and valve wrench; glue not included). Tower Paddle Boards is a premiere stand up paddle boarding manufacturer. They made waves in the SUP community after a buy in from Mark Cuban during the fourth season of Shark Tank. Today they are one of the best paddle board manufacturers offering excellent products for beginning and advances paddlers. Tower’s marketing pitch is they’re a direct to customer SUP retailer, which means they are 30% – 50% cheaper than the competition. They are certainly one of the cheapest high-end SUP brands on the market, but 30% – 50% might be a bit of an overstatement. Let’s take a closer look at some of Tower’s best inflatable stand-up paddle boards. Tower’s inflatable paddle boards have a reputation for durability. 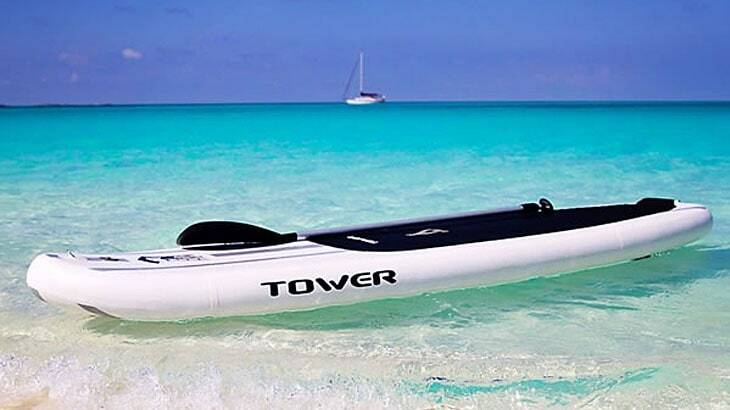 The Tower Adventurer paddle board is no exception to this. Go ahead and throw it off a building or run it over with your car, and you’ll still have a fully inflated board ready to hit the waters! Use it in white water rapids or rocky shores and you’ll definitely conclude that this board is anything but flimsy. It has a weight capacity of up to 400 lbs, making it great for bringing gear, food or your kids. The Tower Adventurer SUP is a world-class inflatable paddleboard, measuring 9’10” x 32″, for a very reasonable price. Customers absolutely love this board. If you’re looking for an all around paddle board, the Tower Adventurer paddle board is a great choice. 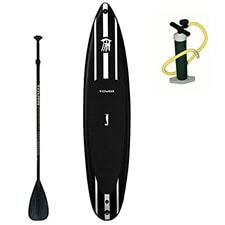 The Tower Adventurer SUP board comes with an adjustable fiberglass paddle and a high pressure hand pump. The durability of the board is thanks to its top notch drop-stitch construction and military grade material. Not only that, because it is an inflatable SUP, you can roll it up like a sleeping bag and bring it to wherever you fancy. Just like the its predecessor, the Tower Adventurer 2 SUP 10’4” is another great paddle board. It’s a little longer so it floats a little more weight and goes a little faster. The new design features a tie-in bungee system that makes it easier to strap things onto your board. The carrying handles also make it easier to carry the board once inflated. The Tower Adventurer 2 SUP is extremely rigid and is able to carry up to 400 lbs. Our research shows beginner and advanced paddlers alike are very satisfied and have a lot of fun with this board. So, if you’re looking for a convenient and travel-friendly inflatable paddle board, the Adventurer 2 SUP is a great buy. 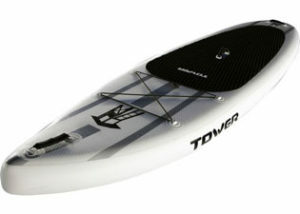 The Tower Adventurer 2 paddle board comes with a 3-piece fiberglass paddle, fin and pump. Described as the best looking inflatable paddle board in the market, Tower iRace paddle board 12’6’’ is the best SUP for beginners and paddleboard enthusiasts out there. It is perfect whether you want to go fast or just for cruising on flat water. When fully inflated, the Tower iRace paddle board, measuring 12’6″ x 30″, can hold up to 400 lbs on water and is very hard and rigid. Like other inflatable paddle boards the iRace is easy to transport with only 1 foot in diameter and 33’’ wide when rolled up. Guaranteed to be durable, the Tower iRace paddle board is made with military-grade PVC material and drop stitch construction so you won’t have to worry about cracks and dents on you board. The Tower iRace comes with a pump and a 3-piece adjustable fiberglass paddle. So whether you’re a beginner or a pro, with this paddleboard you’ll be doing just fine. The Tower Xplorer SUP is an “On the go” SUP racing or touring board that’s also lightning fast. At 14′ x 32″ by 8” thick, the Tower Xplorer paddle board is a revolutionary inflatable design. Originally designed for the jet-setting SUP-racing crowd, the Tower Xplorer SUP package is also ideal for anyone who just wants a crazy fast flat-water touring board. With a thickness of 8” the Tower Xplorer is also extremely rigid. It’s made with military-grade material and, as Tower describes it, is: “nearly indestructible”. The Tower Xplorer also has a massive buoyancy and can carry up to 800 lbs. Perfect for bringing your family or friends and touring together for shared fun. 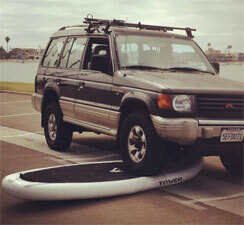 Transporting and storing a 14’ hardboard SUP is usually a pain, but no issue with the Tower Xplorer paddle board. Simply deflate, roll it up and store it in a cupboard. The Tower Xplorer SUP package includes the 14’board, a 3-pc adjustable aluminum SUP paddle and a high-pressure hand pump. We’ve reviewed some of the best Tower Inflatable Paddle Boards. These boards are all of great quality. For beginners and for those looking for a great all around paddle board, we highly recommend the Tower Adventurer 1 or Tower Adventurer 2. With their more all around shapes and reasonable prices, they make for great flat water paddle boards. If you have a greater ‘need for speed’ or intend to go touring, check out the Tower iRace or Tower Xplorer.